This live-action version is its second chance. This film moves those basic elements to the year 2020. I approve. We lose the period historical angle, but that's a good thing since they'd been getting it wrong anyway. (Ciel's Victorian household hadn't had anywhere near enough servants, but you don't need a huge staff like that in a 21st century house.) In this version, our hero(ine) is Earl Shiori Genpou, a girl who's pretending to be a boy in order to be the head of the family and run the family business. Sebastian's still Sebastian, though. The deal's the same. He's a cool-but-evil hero rather than the film's villain, though. For that, we have the people who killed Shiori's family (either directly or indirectly) and some people who are causing gory mummification deaths. There's also a drug called Necrosis, which might possibly be bad for you. You probably guessed from the name. Does the film work? Is it entertaining, or cool, or exciting? Hmmm... sort of. Sebastian can indeed be cool, but unfortunately his presence makes it hard to worry about anything. He's the Devil! That's a bit like having God on the payroll. Their power levels aren't the same, obviously, but it's still hard to think that anything mortal could trouble him or that any threatening situation can't be resolved by a diabolus ex machina. The Shiori/Rin gunfight, for instance, is trying reasonably hard and clearly doing its best, but you don't really believe that our anti-heroes are in danger. They've got Sebastian. (That scene also has an absurd moment when a baddie slowly, deliberately puts a gun to the head of someone who's been gunning down his friends faster than they can blink. If you were that baddie, you'd be moving like greased lightning.) The only restrictions on Sebastian's power are self-imposed, since he'll obey Shiori's orders to the letter and won't lift a finger otherwise. Mizushima Hiro is fine as Sebastian Michaeli. Ayame Goriki is dour and unlikeable as Shiori, but that's what's in the script. She hasn't smiled since her parents were killed in front of her. If I'd sold my soul to Satan, I wouldn't be laughing either. Eventually the character becomes a reasonably sympathetic protagonist, through integrity and sheer bloody-mindedness. The actor you'll notice most is Yuka, who's been given a juicy role as Shiori's aunt. Shiori really needs to think harder about what she says, though. If you're doing deals with the Devil, you need to be precise about every word. He's famous for what he'll do with loopholes. 1. "God does not exist. No one will come to your rescue." All things considered, that's a surprising theological position. 2. "Be the only person not to betray me." It sounds less silly in Japanese, but even so you wouldn't catch me saying that. Firstly, isn't "don't betray me" basically just an order to follow orders? I spy a redundancy. Secondly, that could be taken as an order for Sebastian to tempt everyone else into treachery. This is a gorier, nastier film than you'd think from its silly premise. The mummification deaths aren't nice and the baddies will shoot people for the crime of lying on the floor. It's still not a film you can take seriously, but at least it's trying. On the downside, though, it has a lack of resolution. (One villain gets stopped, but there are more in the shadows and you'll almost wonder if the filmmakers were aiming for a sequel. If so, it didn't happen.) I'm also unsure that Sebastian's powers were extensive enough to be really convincing as the devil. He's indestructible and super-fast, but we never see him perpetrating magic, miracles or rubber reality (although in fairness I do remember some of that in my brief exposure to the anime). Does it work on a human level? Sort of. Sebastian-Shiori ends up going somewhere mildly interesting, while Yuka's a bit of a showstopper. 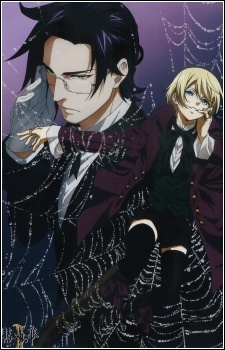 Did it make me want to watch more Black Butler? Nope.